Annual. Culms 200-300-400 cm long; with prop roots. Lateral branches ample. Ligule a fringe of hairs. Inflorescence composed of racemes. Racemes single. Rhachis fragile at the nodes; semiterete. Rhachis internodes cuneate. Rhachis internode tip transverse; crateriform. Spikelets in pairs. Fertile spikelets sessile; 1 in the cluster. Companion sterile spikelets pedicelled; 1 in the cluster. Pedicels cuneate; tip rectangular. Companion sterile spikelets well-developed; separately deciduous. Companion sterile spikelet glumes muticous. Spikelets comprising 1 basal sterile florets; 1 fertile florets; without rhachilla extension. Spikelets oblong (1), or ovate (1); dorsally compressed; 6-6.5-7 mm long; falling entire; deciduous with accessory branch structures. Spikelet callus pubescent; base truncate; with central peg; attached transversely. Spikelets comprising 1 basal sterile florets; 1 fertile florets; without rhachilla extension. 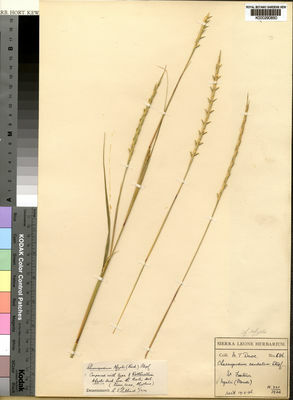 Spikelets oblong (1), or ovate (1); dorsally compressed; 6-6.5-7 mm long; falling entire; deciduous with accessory branch structures. Spikelet callus pubescent; base truncate; with central peg; attached transversely. Glumes reaching apex of florets; firmer than fertile lemma. Lower glume oblong (1), or ovate (1); coriaceous; 2-keeled; winged on keel; 20-35 -veined. Lower glume intercarinal veins obscure (1), or distinct (1). Lower glume apex entire, or dentate; 2 -fid; obtuse. Upper glume oblong (1), or ovate (1); coriaceous; 1-keeled; winged on keel; 7-9 -veined. Upper glume apex obtuse. Basal sterile florets male; with palea. Lemma of lower sterile floret oblong (1), or ovate (1); hyaline; 3 -veined. Fertile lemma oblong (1), or ovate (1); hyaline; without keel; 3 -veined. Lemma apex obtuse. Palea hyaline; 2 -veined. in F.T.A. 9: 76 (1917).